Mouse anti Human CD55 antibody, clone BRIC216 recognizes the CD55 antigen, a ~70 kDa glycoprotein also known as Decay Accelerating Factor (DAF). CD55 is distributed on erythrocytes and other circulating blood cells and also on cells in non-haemopoietic tissue particularly epithelium and endothelium. CD55 is also expressed at the foetal-maternal interfaces in placenta.CD55 has reduced expression on individuals with paroxysmal nocturnal haemoglobinuria. Mouse anti Human CD55 antibody, clone BRIC216 has a functional binding affinity to erythrocytes of 8.7 x 107 M-1. The antigen is pronase and trypsin resistant and chymotrypsin sensitive.  Mouse anti Human CD55 antibody, clone BRIC216 recognises the consensus region 3 of the DAF molecule, which contains the functional site, and the antibody blocks the function of DAF. 2 Clone BRIC216 recognises human CD55 under non-reducing conditions. Coyne, K.E. et al. (1992) Mapping of epitopes, glycosylation sites, and complement regulatory domains in human decay accelerating factor. J Immunol. 149 (9): 2906-13. Loberg, R.D. et al. (2006) Inhibition of decay-accelerating factor (CD55) attenuates prostate cancer growth and survival in vivo. Triantafilou, M. et al. (2000) A 70 kDa MHC class I associated protein (MAP-70) identified as a receptor molecule for Coxsackievirus A9 cell attachment. Hum Immunol. 61 (9): 867-78. Tieng, V. et al. (2002) Binding of Escherichia coli adhesin AfaE to CD55 triggers cell-surface expression of the MHC class I-related molecule MICA. Proc Natl Acad Sci U S A. 99: 2977-82. Pahwa, R. et al. (2016) Modulation of PBMC-decay accelerating factor (PBMC-DAF) and cytokines in rheumatoid arthritis. Mol Cell Biochem. 414 (1-2): 85-94. Kim, M.S. & Racaniello, V.R. (2007) Enterovirus 70 receptor utilization is controlled by capsid residues that also regulate host range and cytopathogenicity. J Virol. 81 (16): 8648-55. Wu, G. et al. (2007) Coagulation cascade activation triggers early failure of pig hearts expressing human complement regulatory genes. Liszewski, M.K. et al. (2007) Modeling how CD46 deficiency predisposes to atypical hemolytic uremic syndrome. Wiesner, J. et al. (1997) Host cell factor CD59 restricts complement lysis of Plasmodium falciparum-infected erythrocytes. Eur J Immunol. 27 (10): 2708-13. Fodor, W.L. et al. (1995) A novel bifunctional chimeric complement inhibitor that regulates C3 convertase and formation of the membrane attack complex. J Immunol. 155 (9): 4135-8. Tu, C.F. et al. (2010) The in vitro protection of human decay accelerating factor and hDAF/heme oxygenase-1 transgenes in porcine aortic endothelial cells against sera of Formosan macaques. Transplant Proc. 42 (6): 2138-41. J Leukoc Biol. 86 (1): 155-66.